My graduate school days are dwindling away, and though I've recently started a new job, I'm excited by the idea of having *free time* on my hands for the first time in what seems like forever! No school? Seems like a luxury! So I wanted to introduce a new feature that I think will help me keep this blog active, since I got into a reviewing slump and was only posting podcast recaps for quite some time. 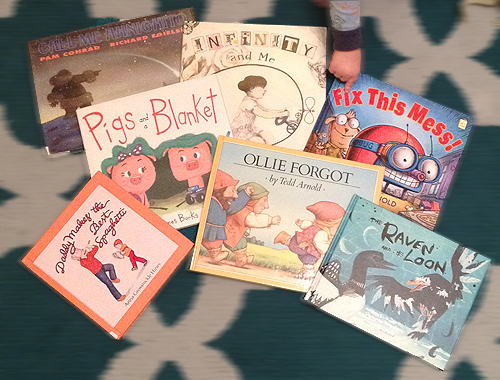 What We Read This Week is a weekly round-up of all the books my son read - the good, the bad, and the ugly. I'm going to write micro-reviews of the books we shared, and include all of our reactions in order to give a well-rounded idea of if you and your kids would like these books. Ollie Forgot by Tedd Arnold. This book was fun to read aloud because of the repetition of the (few!) things Ollie remembered. My son LOVES repetition, so I actually repeated the lines a few more times than they were written, and the story didn't suffer for it. There's room for a lot of embellishment and interaction in this cute story about Ollie running an errand for his mother, and everyone he encounters along the way. We all enjoyed this book, and it will definitely be re-read. Pigs and a Blanket by James Burks. This story of a brother and sister learning to share is told more in bright, inviting illustrations than words. It's a great interactive book because you can talk about the illustrations and have your little one chime in with what's going on. My son picked this one as his favorite book of the week when I asked, but he might be a little biased - he loves piggies! Daddy Makes the Best Spaghetti by Anna Grossnickle Hines. Daddy read this one aloud, of course, because the daddy is the star of the show! It's a sweet story about a little boy running errands and helping Daddy around the house while Mommy works. It's a playful book so it's fun to read, but it also goes over routines done throughout the day and enforces that idea to the reader. The Raven and the Loon by Rachel and Sean Qitsualik-Tinsley, illustrated by Kim Smith. This book is beautiful - the cover and illustrations are so gorgeous I had to bring it home when I saw it on the library shelf. This is one of those books that might be more for adults though - it's gorgeous, but I don't think kids would be sucked into the illustrations too much. The book is an origin story of how the raven and the loon came to look as they do, so it's better suited for older kids who can ask and understand "why", as well as appreciate the folklore aspect. Fix This Mess by Tedd Arnold. Another favorite of the week - a cute story about a messy house and a pup who's too lazy to clean it himself. The puppy sends away for Robug, a cleaning robot machine. Except Robug doesn't so much CLEAN the mess as relocate it... will the house ever get cleaned? My son loves robots, so he loved Robug and keeps asking for it to be read again and again. This is a library book, but we might have to get our own copy since it's such a hit. Call Me Ahnighito by Pam Conrad, pictures by Richard Egielski. My son is way too young for this book. He picked it off the library shelf himself, but he wasn't too interested in listening to it. The illustrations are very realistic and dark-colored, as well, so it wasn't too engaging. The story is pretty long; it's based on a true story of a meteorite that fell to earth, so it'd be better suited for older kids interested in rocks, space, and science.